Now Eat This! 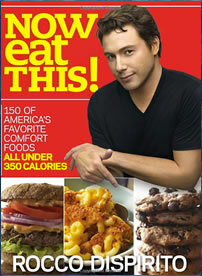 is a cookbook created by Chef Rocco Dispirito that offers low calorie alternatives for “150 of America’s favorite comfort foods” such as Mac and Cheese, Spaghetti, Nachos, Brownies and Ice Cream. Disprito, who has been a guest chef on the television show “The Biggest Loser”, was asked by the program to create healthier versions of the contestants favorite foods, which he refers to as “bad boy foods” or “downfall dishes”. All of the healthy comfort food recipes contain no fat, no sugar, no cholesterol and no salt with each serving providing less than 350 calories. See also Rocco’s weight loss plan The Pound A Day Diet. Disprito says that the real answer to eating healthy is to eat the foods you like but to eat healthful versions of them. He introduces readers to some of his tips and tricks for reducing the caloric intake of healthy comfort foods without compromising on flavor. For example, black beans are used as a substitute for flour and butter in brownies and Greek yogurt replaces butter and cream in Mac and Cheese. Instruction is also provided in flavor-saving fat-free cooking techniques such as broiling, flash frying, grilling and poaching. The healthy comfort foods recipes are divided into categories for appetizers, soups, salads, sandwiches and pizza, fish and shellfish, chicken and turkey, beef and pork, pasta and more, sides, sauces and dessert. For each recipe nutritional information is included and the calorie and fat count is compared to the traditional version of the meal. Almost all of the dishes can be prepared in about thirty minutes and are based on everyday items available from your local grocery store. Only basic cookware is required such as a frying pan, saucepan, baking sheet and mixing bowl. Greek yogurt, reduced fat cheese, egg whites, salmon, tuna, crab, chicken, turkey, lean meat, whole wheat pasta, whole wheat flour, sprouted grain bread, rice, black beans, apples, peaches, blueberries, cauliflower, broccoli, lettuce, spinach, sweet potato, dijon mustard, cornstarch, fresh herbs, spices, low sodium soy sauce, low sodium chicken broth, salsa, Splenda, dark chocolate. Now Eat This does not include exercise recommendations, however, the author states the importance of exercise and discusses his personal weight loss story. He describes how he recruited a personal trainer and increased his cardiovascular exercise to lose weight and eventually competed in a triathlon. Now Eat This! : 150 of America’s Favorite Comfort Foods, All Under 350 Calories retails at $22. Contains a variety of appealing healthy comfort foods recipes with photos. Meals are low in fat and sugar-free. Family friendly approach to weight loss. Now Eat This recipes are easy to prepare with everyday ingredients. Nutritional information provided by a board-certified nutritionist. Now Eat This is not a complete weight loss program. Does not include healthy comfort food breakfast recipes. Now Eat This! will appeal to dieters who want to reduce their caloric intake with healthy comfort foods to replace the high calorie versions. By using these recipes and consuming them in the appropriate portion sizes, dieters can indulge without feeling guilty. It is important to keep in mind that Now Eat This is not a complete weight loss program and in order to successfully lose weight it is necessary to pay attention to stress management and to engage in regular physical exercise.